Some major home appliance manufacturers and part suppliers have begun to make available appliance part lists with illustrated exploded view schematic diagrams on-line. We at Appliance411 have compiled this list of sites were this is possible. Of course, the exact model number off the appliance will be required and occasionally the serial number or other information as well. If you need help in locating these on your appliance, check the Appliance411 Parts section's "Where to find the model number". Tip: The last digit of many model numbers is often a number not a letter. What may appear to be the letter O, I or Z may actually be a #0, #1 or #2. It does matter when dealing with computers! Some models listed� at the Repair Clinic web site. � Part photos only, no exploded views. Many models also listed at Appliance Part Pros. Enter the model of your Sears Kenmore home appliance (complete with the model number prefix) and you will be able to view the associated part lists for it. Sorry but mostly US models appear to be cataloged at this time. Some models listed� at the Appliance Part Pros web site. 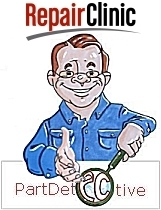 Most models listed� at the Repair Clinic web site. Tip: Try adding or removing a dash after the first 3 letters in the model number. Eg QKO751 instead of QKO-751 or vise versa. 'Text only' parts lists at the Panasonic Web site. For domestic (home) models see Amana. For domestic Canadian models - see Inglis. You can also try . . . The PartDetective� walks you through an on-line appliance parts catalog by asking you a series of questions including appliance brand, product type, whether the part is electrical, metal or plastic, its color and approximate size. Once finished, the PartDetective� displays components for that product along with their photographs and descriptions. The results are sorted by the criteria you've entered so the most likely items appear first.